The Need to Know on New Constructions - Champion Title & Settlements, Inc. | Title Company | Virginia | Maryland | D.C.
With the current housing inventory running a little low, you may be struggling to find your dream home. But before you settle for a home that you don’t really love, consider the idea of a new construction. For many, buying a new construction is a dream, and there are many benefits to building your own property. With a brand new home comes many freedoms in design and amenities, in addition to other perks such as knowing the history of the property. However, a new construction can be a very costly and time-consuming project, so there are many questions that you should get answers to before signing any contracts. When considering a builder, the first question you should ask is if you can visit some past work samples. Visiting a property that they have built is a great way to get a feel for their architectural style and decide if it suits your own general vision for your home. If you are fortunate enough to see one of their older homes, you will also get a good idea of how they’re homes hold up over time. The biggest benefit of visiting their prior builds is having the opportunity to meet the owners and hear about their experience with the builder. It can be easy to assume that when a builder creates your dream home for you, all of the bells and whistles will be included, but that is not always true. Most builders will give you a base-price for the home and it is important to understand what that includes. For many new constructions, appliances such as toilet paper holders, window coverings, and light fixtures are not included, and although those are minor costs, they do add up and you could be paying a lot more than you first budgeted for. Knowing what is included in the base price and what is only included in an upgraded version will save any surprise bills further down the line. Some of these upgrades can also be done at a later time, and for a cheaper price, by a private contractor, so shop around and figure out what you really need from the builder. One of the main draws of a new construction is the idea that you can make it your own, but not all builders will be willing to incorporate your ideas into their vision. Finding out what areas, if any, you will have the opportunity to customize will allow you and the builder to draw up a clear picture of how the home will look. It is important to be on the same page with the builder at all stages of the build so there are no surprises when you have the grand unveiling. When deciding on customization, keep in mind that your house will most likely be sold to someone else in the future. Make improvements that will add to the value and give you and your family some extra cash down the line. A new construction is a brand new property built by a professional contractor, so there is no need for an inspection right? Wrong! Everyone makes mistakes, builders included, so getting an inspection before you go to the settlement table might be a smart move. Most builders will also offer warranties on their homes, most commonly an implied warranty or an express warranty. Knowing which of these warranties is correct for you and your situation can be tough, so having an agent or attorney that can read all the fine print for you can be helpful. It is important to note that most warranties will not cover appliances made by a manufacturer, general wear and tear, defects caused by neglect, or any defects on areas installed by yourself or a personal contractor. Finally, waiting on your home to be built can be an anxious time, so knowing upfront how often you will be able to see your property can calm some of those nerves. If you do get to see your home on a regular basis it is important to keep patient and trust the builders’ vision. It is likely that your main point of contact will not be the builder themselves, so make sure you know of at least one person you can get in touch with if you have any questions. 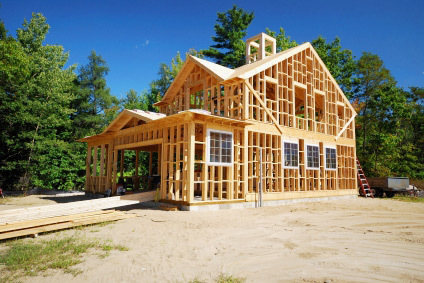 Go to www.championtitle.com to see how Champion Title & Settlements, Inc. can help you close on your new construction.